These are the reasons for the decision in the appeal of Vathsala JEGANATHAN (a.k.a. Vatsala SATKUNARAJAH, Vathsala Satkunarajah and Satkunarajah Vathsala) (the “appellant”) pursuant to section 77 of the Immigration Act [See Note 1 below] (the “Act”) from the refusal to approve the sponsored application for permanent residence of her husband, Jeganathan Sinnathurai (the “applicant”) from Switzerland. Note 1: R.S.C. 1985, c.I-2. The appellant, who was represented by Mr. Max Berger, Barrister and Solicitor, testified on her own behalf and tendered a package of documents into evidence. The Minister of Citizenship and Immigration (the “respondent”) was represented by an Appeals Officer, Mr. John Buchanan. At the interview which took place in March at our office in Berne, you admitted to me you used a false passport in October 1988. You were then leaving Madras for Italy via Alitalia with the help of a smuggler. You also admitted leaving this false passport to another smuggler when you landed in Rome, where you then left for Switzerland to claim refugee status. Note 2: Record, pp. 3-4. Note 3: Record, p. 14. Evidence indicates that the applicant ultimately was recognized as being a Convention refugee by Swiss authorities. The applicant has lived in Switzerland since his arrival and has maintained steady employment there. The appellant testified that after having known the applicant for many years in Sri Lanka, they were married in Switzerland on 27 May 1994. The appellant has travelled to Switzerland to be with her husband in 1994, 1995 and lastly in 1997. The appellant testified that “she is not in a position to live without him” and is desperate to have him with her in Canada. The appellant argues that the refusal is invalid in law and cites the Federal Court-Trial Division decision in Vijayakumar [See Note 4 below] as the authority which binds me. Note 4: Vijayakumar v. Canada (Minister of Citizenship and Immigration) (1996), 33 Imm. L.R. (2d) 176 (F.C.T.D.). Failing a finding that the refusal is invalid in law, the appellant argues that there are substantial humanitarian or compassionate grounds that warrant the granting of special relief. The respondent argues that Vijayakumar is distinguishable from this case and thus not binding on me. Furthermore, he argues that there exist no reasons to grant discretion on humanitarian or compassionate grounds and therefore this appeal should be dismissed. if that person came to Canada directly from the country that the person left, or outside of which the person remains, by reason of fear of persecution. Note 5: Supra, footnote 4. The respondent stated that section 95.1 of the Act is not meant to give blanket exemption for those seeking to come to Canada but provides for a deferral of prosecution for certain offences for persons claiming to be a Convention refugee. I agree with the respondent. The respondent then argued that, unlike the Vijayakumar case, the applicant: was not on his way to Canada to claim Convention refugee status; did not travel from home country to host country directly to claim Convention refugee status, but stopped off in a third country, Italy, before travelling to Switzerland and, the applicant has never been found to be a Convention refugee with respect to Canada. As I understand the respondent’s argument, in order for section 95.1 of the Act to be applicable here, the applicant would have had to claim refugee status in the country where he first landed, which, in this case, is Italy, not Switzerland, and had to have a “connection” with Canada either in the form of Canada being his final destination or being recognized by Canada as a Convention refugee. I find the respondent’s arguments confusing. First, it is not clear to me why the route the applicant took should be fatal to his application for permanent residence to Canada. Evidence indicates that the applicant’s stopover in Italy was not lengthy but merely transitory in nature. The applicant’s goal was to leave Sri Lanka for Switzerland to claim Convention refugee status there. The applicant achieved his goal. There is no evidence to indicate that he did not do this expeditiously or in an otherwise circuitous way. I note that in Vijayakumar the applicant’s husband also stopped off in a third country (the United States) and also did not claim refugee status there, yet this was not adversely viewed by Jerome J. Second, following Vijayakumar, nowhere in section 95.1 of the Act do I see a requirement that the applicant must be specifically recognized as a Convention refugee with respect to Canada in order to avail himself of the protection from prosecution offered by that section. Lastly, I also do not see section 95.1 of the Act as exclusively requiring the applicant to have Canada as a direct destination upon leaving Sri Lanka. I find that that the applicant falls squarely within the ambit of section 95.1 of the Act, as contemplated by Jerome J. in Vijayakumar. The evidence indicates that the applicant used false travel documents to escape Sri Lanka from persecution. 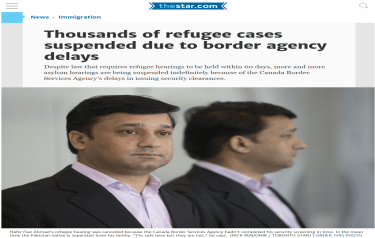 He travelled to his intended destination of Switzerland to claim Convention refugee status and was subsequently granted such status. On 1 February 1995 the applicant notified a Canadian immigration officer of his claim. According to evidence on file, the applicant remains outside of Sri Lanka by reason of fear of persecution. I therefore conclude that Jeganathan Sinnathurai did not commit an offence as contemplated by section 19(1)(c.1) of the Act. Furthermore, in the circumstances of this case, there are sufficient considerations to warrant special relief on humanitarian and compassionate grounds. The appeal made pursuant to sections 77(3)(a) and (b) of the Act is therefore allowed. DATED at Toronto this 5th day of December, 1997.